The precise date of the opening of the pub now known as The Fat Cat is not known. The first lease of the land in our possession, which covers "various premises and dwelling houses on land next to Cotton Mill Walk" was dated October 1st 1832. It covered the land now occupied by the pub and the beer garden. Perhaps there was a pub included in that description, but we do not know. What is known is that the original pub did not have a toilet block and that land as well as the beer garden contained a number of houses. Cotton Mill Walk still exists, it is the narrow cobbled lane by the side of the pub. A later lease of 1852 makes mention of the "beerhouse known as The Kelham Tavern", the name by which the pub was originally known. Alma Street appears to have been built in early 1855. It was named after the Battle of the Alma, a major battle in the Crimean War that took place on 20th September 1854. The first name of a beerhouse keeper that can be traced to the premises was Abraham Cook in 1852. In Melville & Co's Commercial Directory of Sheffield for 1859 the name had changed to Alma Hotel and Abraham Cooke was still the victualler, or licensee as we would call him today. The name Alma was retained until 21st August 1981. The designation of 'hotel' had been removed, but in 1981 all of the upper rooms were numbered and had operating locks, suggesting that it had remained as a commercial hotel for many years. From the many historical documents in our possession (including 17 leases) we know that William Stones Brewery purchased The Alma in 1912. In August 1914 Messrs Wm Stones applied for planning permission to extend The Alma Hotel. At that time the room that is now the bar room was divided into a Public Bar (with a door on the corner) and a Smoke Room next to the toilet. The room, which is now the No Smoking Room, was known as the Tap Room. The upstairs room was known as The Club Room. Adjoining the end of the existing corridor and storeroom was a row of houses. Therefore the current wall to the beer garden, which looks quite ancient, was built after this date. So was the gateway that is now across Cotton Mill Walk. On 23 December 1952 Wm Stones got planning permission to further extend The Alma Hotel. Two floors were to be built above the current toilets, a new toilet was to be built in what is now the beer garden and the room which is now the No Smoking Room was to be extended into the room which is now the kitchen. The then four hotel bedrooms would have been extended to eight.. Although approval was granted these work were never undertaken. It was purchased on 29th July by Dave Wickett and Bruce Bentley and opened as The Fat Cat on 21st August 1981. The idea was to provide an alternative to the pubs owned by the big breweries, which at the time dominated the City. A range of beers was introduced that were new to the area. Prominence was given to beer from small independent breweries, and a guest beer policy was introduced, the first ever in Sheffield, which allowed a wide range of choice. 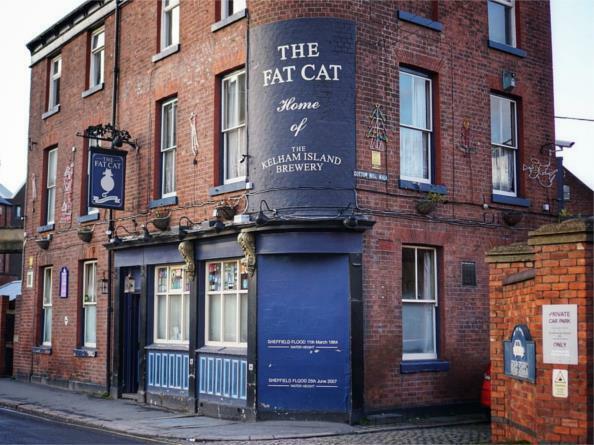 The Fat Cat became the first outlet in the Sheffield for beers such as Fullers, Boddingtons, Greene King, Marstons, Theakstons and Timothy Taylors. Traditional scrumpy and unusual bottled beers were also introduced. At the opening the first pint was officially pulled by the Sheffield footballing icon, Derek Dooley. A no smoking room was introduced, the first in the area. Open fires were reintroduced for winter, and it was decided to have no music, fruit machines or other electronic games or machines. Home cooking was introduced with a menu that always has a choice for those wanting meat, fish, vegetarian, and vegan or gluten free food. The beer garden was opened for the first time. Central Heating and a damp course were added in March 1987. Dave Wickett bought out Bruce Bentley in December 1989. A brewery was built in the beer garden in 1990 and first brewed in September of that year. The Fat Cat has won considerable acclaim. It was the Sheffield branch of the Campaign for Real Ale's first pub of the year in 1982 and became the first pub to win the award twice when it won it again in 1992. It was awarded it a third time in 1998. It has been a regular entry in The Good Beer Guide. The Good Pub Guide awarded it the Best Value in Britain Pub Title in 1997, 1998 and 2000. In its competition to find the best pub in Britain, The Times placed The Fat Cat in its top five urban pubs in the country in July 1999. On 6th January 1995 the Minister for Sheffield, Ann Widicombe paid an official to The Fat Cat when visiting the city. In February 1999 the new Kelham Island Brewery building opened next to the Fat Cat. On 1st May 1999 the original brewery was opened as a Visitor's Centre by ex Whitbread Head Brewery Harold Burkenshaw (famed for inverting Gold Label in the nearby Tennant Brothers' Brewery). In 2000 The Fat Cat became a listed building. In February 2000 the Bishop of Sheffield mashed in Cathedral Ale in the brewery and was interviewed in The Fat Cat by both BBC and ITV regional news. On 10th December 2003 Sheffield local footballing legends Tony Currie and David Hirst spent two hours at The Fat Cat launching eponymous beers, brewed next door. "Glorious beer and great food amid idyllic surrounds-it needn't be just a pipe dream with our guide to Britain's hostelries"
On 16th November 2004 BBC Breakfast News filmed live at The Fat Cat. Arriving at 4.45 a.m. the first live clip went out at 6.38 a.m. followed by seven other live clips filmed in different parts of the pub. On 25th October 2005 BBC News filmed at the pub for their 10p.m News. It was shown that night. On 4th November 2005 a clip from the News broadcast showing the Fat Cat featured on Have I Got News For You chaired by Jeremy Clarkson.